When walls are decorated with dark paint or wallpaper, it can add a crisp, gorgeous quality to a home like nothing else. The intense contrast with the objects in it highlights every detail, much like a black stage in a theater highlights the scenery. Plus, it can give a modern edge to even a highly traditional design. But, dark walls can also make a room feel cave-like and claustrophobic, particularly in a a house without sufficient light or the right light. Here are nine examples I think show how versatile, and effective, this choice can be — and the reasons why I think they succeed. The dining room is a fantastic place to add dark walls, to lend some drama to your evening meals. In this dining room that House Beautiful published, the black dining room walls by William Brinson of House of Brinson reminds me of fantastic libraries in crumbling old mansions — there’s something moody and intellectual about it. Plus, the picture frames stand out against it. Here’s another photo from House of Brinson that also shows how the gorgeous Kravet drapery complements the wall color. This dining room with black walls is by Roughan Interior Design in Connecticut. In this case the designer chose to only paint a portion of the walls black. The shiny charcoal grey velvet chairs layer beautifully against it, and the shine from the mirror and the pendant lamp add touches of gleam. 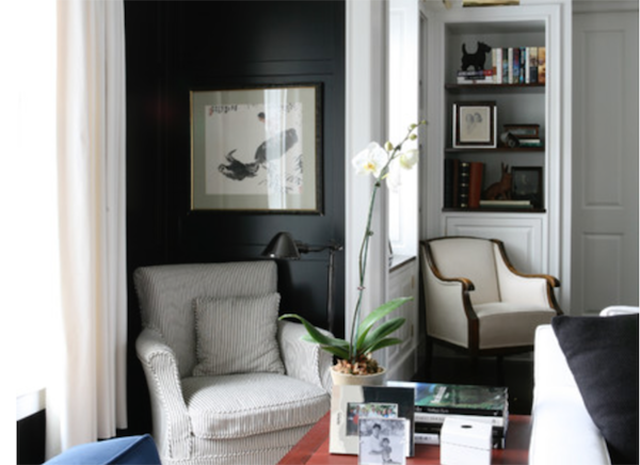 In this living room published by Elle Decor these walls appear dark charcoal gray, leaning towards black. The white ceiling, white lamp shades, and the white trim around the door really pop. Plus, the walls are textured, making the smooth finishes seem even more polished. This room is very contemporary architecturally — no ceiling molding. I love the way the wall color contrasts with the velvet sectional sofa. Another great example is this Victorian family room in a Hyannisport residence by LDa Architecture & Interiors. 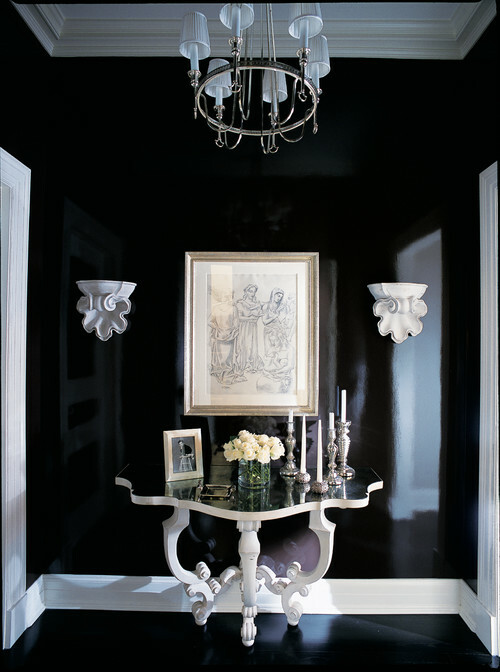 As the designers say, “When painting a wall black, go for an eggshell or satin finish to avoid an ashy look.” Smart advice. In this contemporary New York living room by designer Steven Gambrel, from his book Steven Gambrel: Time and Place (Abrams), the designer combined yellow and black to make a room that stands out as different from any other room you’ll ever see. The lacquered walls sparkle in the sunlight, and are tied into the shiny black leather armchairs and the glossy lampshade. You may need to skim coat walls, patch divots, repair unevenly taped drywall and more. Tip: Hold a flashlight parallel to the wall and play the beam slowly over the surface to pinpoint imperfections. Consort Design transformed a warehouse in the L.A. arts district into an open work space for venture capital firm Greycroft VC. Something like this could be very cool for a home office or a basement hang-out space. The bright pinpoint lights, and the stark white shelving and accessories, boost the contrast even higher. Then the inverse occurs below: black chairs set against a white wall. I also like how in between these two black-and-white zones there’s a light-colored wooden countertop, which softens it all. Interior designer Amber Lewis‘ bathroom design here uses black walls, which contrast sharply with the light wood floors, the fixtures, and the rug. The light from the small window is bright, making the ceiling and wall of this small space light up and almost appear gunmetal gray. I love that she chose what look like brass fixtures — that little pop of gold draws in the eye. There is nothing passive about the black here, where it is perfectly balanced by the white and reflective surfaces. So true! 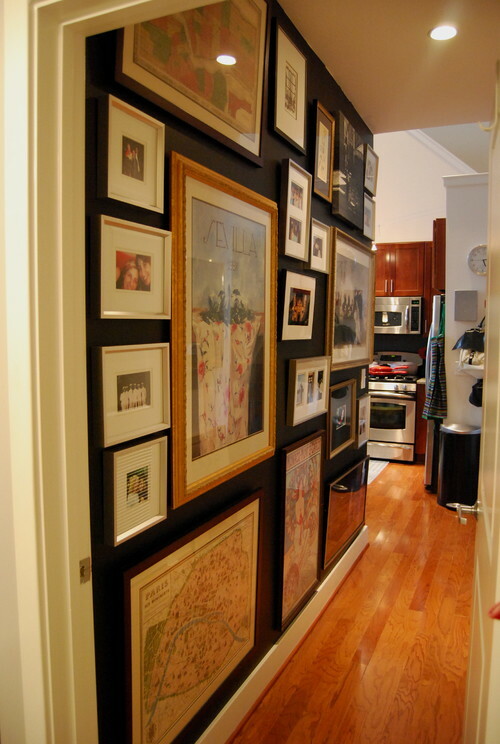 In this case, the black wall is actually in a master hallway. But I think it’s a great example of how a foyer can make a strong, glamorous statement from the moment you cross the threshold of a home. Here the walls are lacquered, which gives it its shine. Do you have questions about using dark paint or wallpaper? Suggestions? Leave a comment!